It’s Autumn, so many locals are burning off their grasslands, or setting fire to their stacked bonfires of fallen branches and creek logjam clearings. 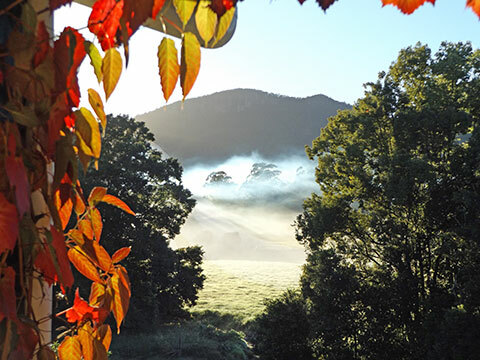 Being Autumn, it’s also a time of misty mornings and low-angled sunray surprises in this valley. This particular morning I was treated to a combination of them both, as the sun’s warmth rekindled the night-dampened bonfire into smoke and released the paddock’s dew into rising mist. Only the smoke’s more blue colouring gave it away. Autumn evenings bring early dark to the valley, while the far escarpment holds the last of the setting sun’s light. It also often holds the gathered moisture of the day in a long rolling breath along the ridgeline, hugging the last of the land before becoming sky clouds.